Do you feel disconnected with your life and the world around you? Have you have found your purpose and would like to help others find theirs? Perhaps you want to add another element to your existing practice? Through Ancient-Earth Mindfulness, you can help people heal and find their purpose, all whilst looking after our planet. The Wayapa® Practitioner Diploma Course is a 7 Day, accredited, live training program which, once successfully completed, will qualify an individual to deliver Wayapa® Workshops. The Diploma Course will be run in Melbourne in from Sunday 18th August to Saturday 24th August 2019 at CERES Enviornmental Park, Corner Stewart & Roberts Streets, Brunswick East. Situated close to Melbourne’s inner city, CERES is an award winning, not-for-profit, environment and education centre and urban farm located just 6 kilometres from Melbourne CBD & is a destination venue filled with lush native and edible gardens, open green spaces, roaming chickens and a range of social enterprises contributing to a truly sustainable future. CERES is easy to reach by Tram 96, Northcote train station, Bus 503 or bicycle along the Merri Creek cycle path. There is also parking available on site and close by. REGISTER NOW - SPACES FILLING FAST! Please note, attending all 7 Days of the Course is part of the assessment criteria to receiving a Diploma. Anyone 18 years and over can enrol. Payment options include credit card, bank transfer or a 6 Month / 12 Month Payment Plan. The Founder of Wayapa®, Jamie Thomas will deliver the training with the support of Sara Jones, Co-Founder & Director of Wayapa® Wuurrk. In keeping with traditional Indigenous teaching, the format of the Course will be based on experiential, interactive and hands-on learning. There are a maximum of 10 places per course to provide an intensive learning environment for each student. Day 1 to Day 5, participants will be immersed in learning the philosophies, concepts, knowledge and elements of Wayapa® as well as learning how to teach Wayapa® as a physical practice and as a visualisation. On Day 6 & Day 7, each participant will be required to deliver the Introduction to Wayapa® Workshop to the rest of the group as part of the assessment criteria. To be deemed competent and qualified at the end of the 7 Day Live Training Course, every participant will be required to have attended each day of the Course and satisfactorily delivered the Introduction to Wayapa® Workshop to the group. Wayapa® is the only known Earth Connection Wellness Practice, based on Indigenous knowledge, that is certified by the International Institute for Complementary Therapists (IICT) and this is the only accredited course of its kind world-wide. Once participants have completed the relevant training, have been deemed competent and been awarded their Diploma, participants will be eligible to be granted a licence to use Wayapa® Wuurrk’s logo and branding. All Graduates must sign the licencing agreement, which includes a Code of Conduct, to be able to deliver Wayapa®. I really loved the sense of community Sara & Jamie created in the Diploma course, and I felt incredibly supported by the whole group throughout the process. It was a very safe and encouraging learning environment where all ideas and backgrounds were welcome and appreciated. One of my favourite aspects of the course was the rich conversations and stories everyone shared in relation to their own connection to the earth, their culture or their community. On top of all the fantastic Wayapa training and practice, I learned so much from everyone else in the room! Additionally, Sara & Jamie’s continuing support post-Diploma has been unmatched with any other course I’ve ever done, and I am so grateful for their commitment to building such a strong community of engaged Wayapa Wuurrkers. I highly recommend this training! I undertook the Wayapa Diploma Course in June as a part of my professional development for my workplace, which has been really beneficial in my role. But what I wasn’t expecting was how much it has changed my life. I practice Wayapa everyday, sometimes twice a day!! And am loving it more every day. My movement is improving all the time and have had some other benefits as well. I’ve lost 18kgs since, have quit smoking and no longer need the blood pressure medication I was on! So to say Wayapa is life changing is pretty accurate! 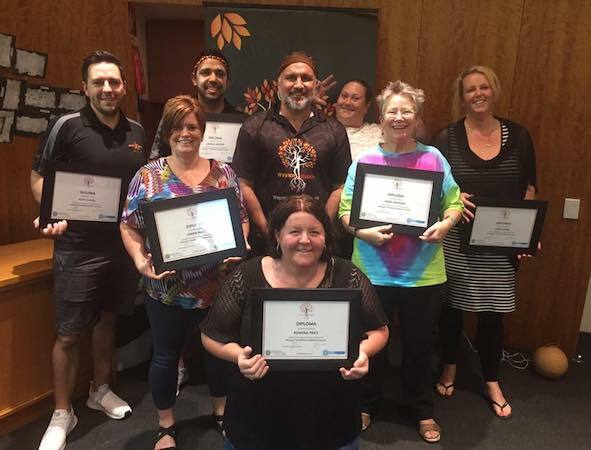 I went into the Wayapa Diploma course with a huge admiration, respect and love for our Aboriginal people and their culture, however I still felt very disconnected from them and I didn’t understand why until going through the 7 days intensive with Jamie and Sara, everything fell into place right at the last day before my presentation! I not only feel more connected to this amazing culture but more connected to the earth and what that means! My indigenous earth soul has been awakened! I’ve been on a mission since to find out more about my Romani Gypsy and Indian culture and their Earth Connection! It’s always been there through the ancestors stories but for some of us it got lost along the way to the modern world. Ngata! Hi! 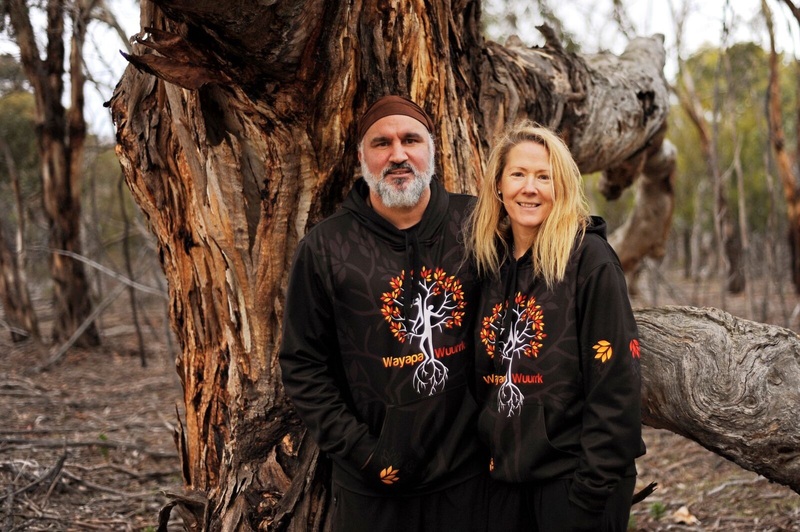 We’re Jamie & Sara, Co-Founders of Wayapa® Wuurrk which translates into Connect Country in the languages of the Gunnai & Maara peoples. So many people have shared with us how disconnected they feel. It causes them so much pain. They feel lonely and isolated. They feel helpless and out of control, often choosing self-destructive behaviour because at least it numbs them for a little while. We know Wayapa® wuurrks because it is based on the ancient knowledge of one of the world’s oldest living people, Jamie’s people…Aboriginal Australians. There is so much richness to be shared from Indigenous thinking. 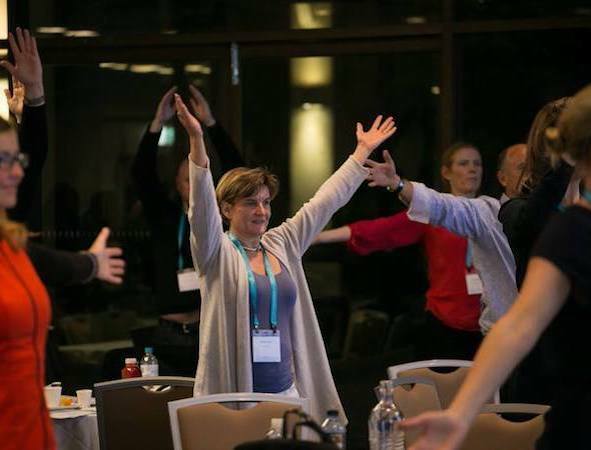 Thousands of people in Australia have already experienced the wellness benefits of living a Wayapa® Lifestyle… and now you you can be part of the movement. Indigenous people believe it takes a village to raise a child…but we go one step further, we believe it takes a village to feel connected so when you become a Wayapa® Wuurrker, you will become a part of the Wayapa® Wuurrk World…a global movement to help heal our relationship with the planet and in turn, create wellbeing for ourselves. We hope you will join us and let Wayapa® Wuurrk for you and your clients! I'm not Indigenous so can I still enrol to be a Wayapa® Practitioner? Absolutely. Wayapa® isn’t a cultural practice, it’s an Earth Connection Practice based on Indigenous knowledge of why it’s important to reconnect everyone to the earth for wellbeing. Is a Wayapa® Practitioner the same thing as a Wayapa® Wuurrker? Yes, we just use Wayapa® Wuurrker as a play on words with our name. Do I have to attend all 7 days of the diploma course? Yes, it is mandatory to attend all 7 days as a course requirement. In case of emergency, attendance can be discussed with the trainers. Do I have to pay a commission or a percentage of my sales to Wayapa® Wuurrk as a licenced Wayapa® Practitioner? No. Once the diploma course fee has been paid, all money earned from delivering Wayapa® goes to the Practitioner. If I receive jobs from Wayapa® Wuurrk to deliver Wayapa® workshops, will I need to pay a commission to them? No, all money earned goes to the Practitioner even if Wayapa® Wuurrk provides a job or a lead. Are there any ongoing costs to be a licenced Practitioner? Yes, the annual licence renewal fee is $250 after the first year. Can I earn a living being a Wayapa® Practitioner? The amount of money you earn is totally up to you as a Wayapa® Practitioner as all Practitioners are independent of Wayapa® Wuurrk. I've done the "How to Reconnect the Disconnection with Wayapa®" online course, does this accredit or qualify me to teach Wayapa® or do I need to do the diploma course? The only way to become an accredited Wayapa® Practitioner is to do the Wayapa® Practitioner Diploma Course. Only accredited Wayapa® Practitioners can teach Wayapa®. Do I have to be licenced to practice Wayapa®? Yes, if you’re getting paid to deliver Wayapa®, you must sign and adhere to the licencing agreement as only accredited Practitioners can deliver Wayapa®. 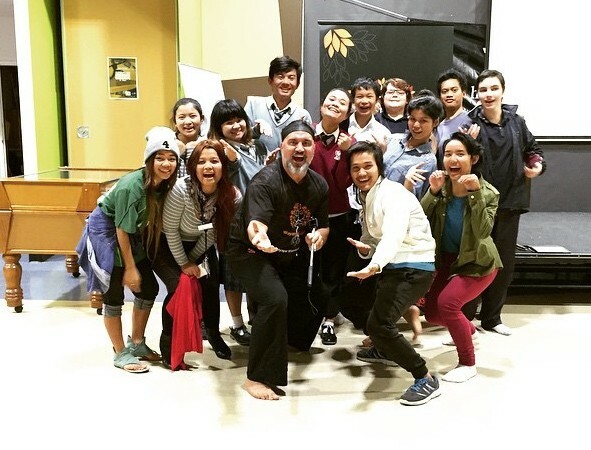 What can I do as a Wayapa® Practitioner? As a licenced Practitioner you can deliver a range of Wayapa® Workshops, short courses and regular classes. Wayapa® Wuurrk stays in close contact with all of their accredited Practitioners to provide support and mentoring.